Spoiler just to be on the safe side, since they married before the last book... Roose Bolton and Fat Walda Frey. Frey + Bolton! and Ramsay will kill every possible child of this marriage! oh nice, people barely mention this blossoming love - i want it to be okay for them.. despite Red Wedding and all... at least Walda! Cat: "I hope she makes you happy"
Bolton:"aye she's made me very rich"
Blackfish: "If you excuse me i need to find a tree piss on"
As far as I remember not in gold, but in silver. Anyway, it's a good deal. I want these two to end up happy when the series ends. A Frey and a Bolton looking cute together. Never thought I'd use those words in the same sentence. Please keep up the great work. Best couple in Westeros (at least the happiest one XD). Thanks! It's hard to match people's mental image of Roose because his description is so intentionally vague. I love your Roose! He reminds me a little of Rutger Hauer... Lovely work, as always. Glad you liked it! And oooh, nice observation, now that I think about it Rutger Hauer is probably the closest actor to my mental image of Roose. 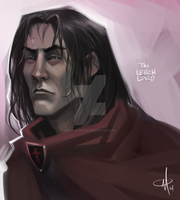 Though I'm kind of intrigued by the guy they picked for the show, can't wait to see the Leech Lord on screen. Ma vedrai che alla fine Ramsay cannerà di brutto su qualcosa e si leverà di mezzo con le sue stesse mani, secondo me. Se riesce a massacrarsi insieme ai Frey è anche meglio. They were actually already married in ACoK, Walda sent sappy letters to him at Harrenhal every day. Yup, I know! But I think it's just in Dance that we actually see them together "onscreen". You can never be too careful with spoiler tags! -could it be that you took an actor as a preference for Roose? Not 100% - I always said that if someone could combine Michael Emerson and Steven Berkoff that would have been the closest casting to my mental image for Roose, so I guess that sort of bled through in the drawing, but I didn't directly reference them. Love his cape. Perfect flayed man attire! I can only hope he gets his own fancy flayed skin soon. Very nice job on this! Yah, they're like, oddly functional! I will never not be amused by this. Had to fave this here!